A couple of weeks ago some bottles of Italian wine arrived in my mailbox. I was allowed to drink them if I created a dish that matched with the wine. A very tough job if you ask me. Last weekend I tried the first wine, La Rustia. 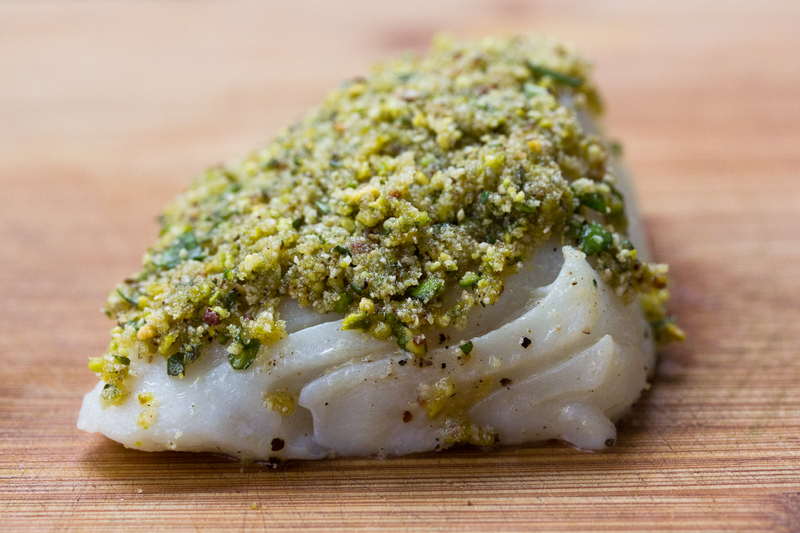 The matching dish was a cod fillet with a herb crust, a white wine sauce with winkles. In Canavese the cultivation of vine started very long ago. A legend even tells that in the age of time Nymphs and Gods had settled on the moraine hills that at the time were the shores of a big lake. Here lived a Nymph called Albaluce whose fame for her beauty went far over the hill borders. Her beauty called to gather every year farmers, shepherds and fisherman who came to honour her, bringing products of the land and of the lake as gifts. Suddenly one day a tribe guided from the queen Yppa came and ended the happy tradition. Needing lands for crops, Yppa did her utmost to drain the lake waters to make space for new crops. So doing she transformed the green lake shores into a sprawl of shrivelled bushes. In front of such a spoiled landscape, Albaluce could not keep herself from crying. Her tears falling on the ground gave birth to new life: vines with long shoots with white golden grapes rose from the soil. This was the gift to the Nymph to her worshipers: this is the way the Erbaluce vine came on the Canavese hills. 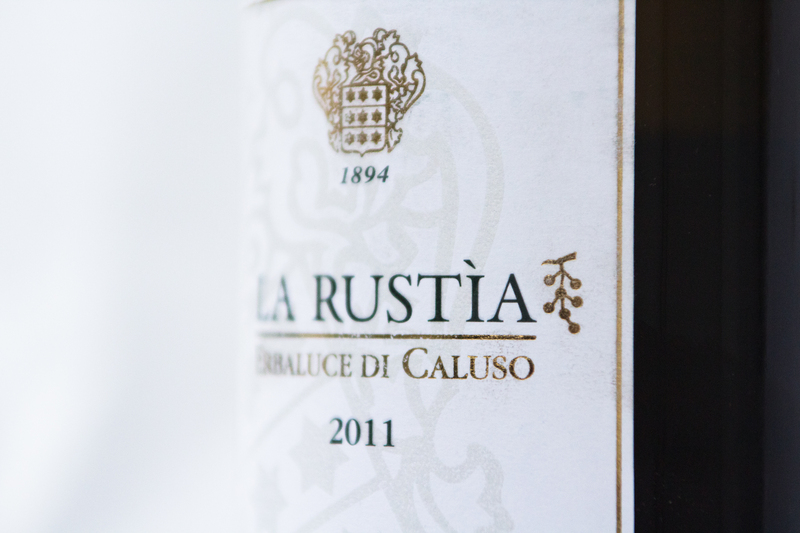 La Rustia 2010 is a dry white wine, made of 100% Erbaluce di Caluso. The colour is as you could see on the pictures pale yellow with some light yellow shades. In the nose the wine is quite strong, fixed with essential oils, laurel and rosemary, with balsamic finish and a note of fresh cut pear and very pleasant citrus. The palate is serious and consistent with a pleasant mineral finish. 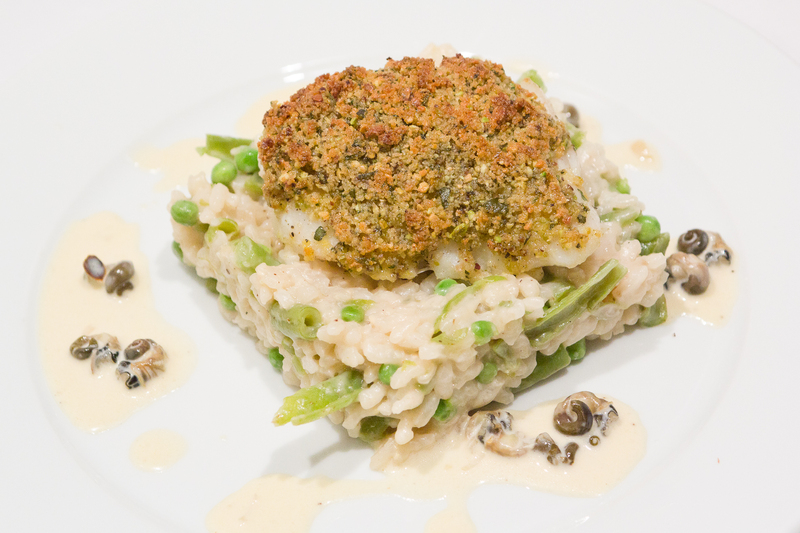 I made one of my favorite dishes: cod fillet with a herb crust, a white wine sauce with winkles and a risotto with green vegetables. According to me it was the perfect match for this white wine. What do you do? The two biggest advantages of this dish are the fact that it doesn’t take a lot of time and that you can make a lot in advance. You can make the sauce and the fish, so the only thing you have to focus on is the risotto. Start with the herb crust. Chop the herbs very fine. Mix it with 3 Tbsp of olive oil, bread crumbs, mustard, pistachios. Season with pepper and salt. Fry the fish shortly in butter and olive oil. 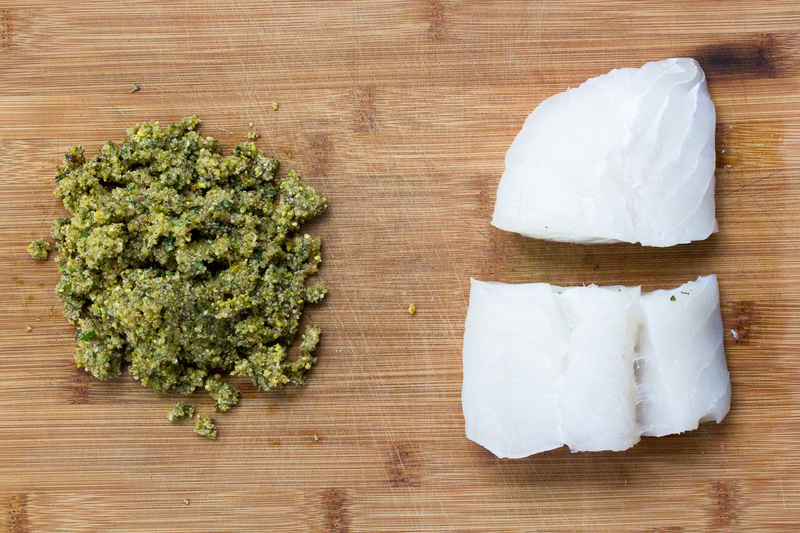 Put the herb spread on the fish and set aside. When your risotto is almost ready, place the fish in the oven on 175°C for about 4 to 5 minutes. The next thing you can make are the beans and the pies. Bring salted water to the boil and add the beans. When ready, take them out and pour them immediately in ice-cold water. Keep aside. I had peas in the freezer so I only had to put them in hot water. The winkles are bit more work. You don’t have to use them of course, it’s just a tasteful extra ingredient. Clean them very well. Bring the fish stock with the vegetables and herbs to the boil. Let it simmer for half an hour. Add the winkles for 4 to 5 minutes. Take them out of the water and pick the sea snails out of the shells. Keep them aside. Just before you serve the warm sauce, add them to the sauce. The only thing you have to make at the last moment is the risotto. It’s pretty easy if you stay alert. Chop the shallot and fry in olive oil and butter. Add the rice. Stir well. Pour the wine on the rice and let it cook. When the rice absorbed the wine, add the fish stock in small amounts. Don’t add everything at once. Stir well. Allow the liquid to be absorbed. While it cooks, the rice releases its starch, giving the risotto a rich, creamy consistency. Like pasta, risotto is cooked until it is al dente. Be sure that it’s not crunchy. At the last moment, add the cheese and the vegetables. Season to taste with pepper and salt. 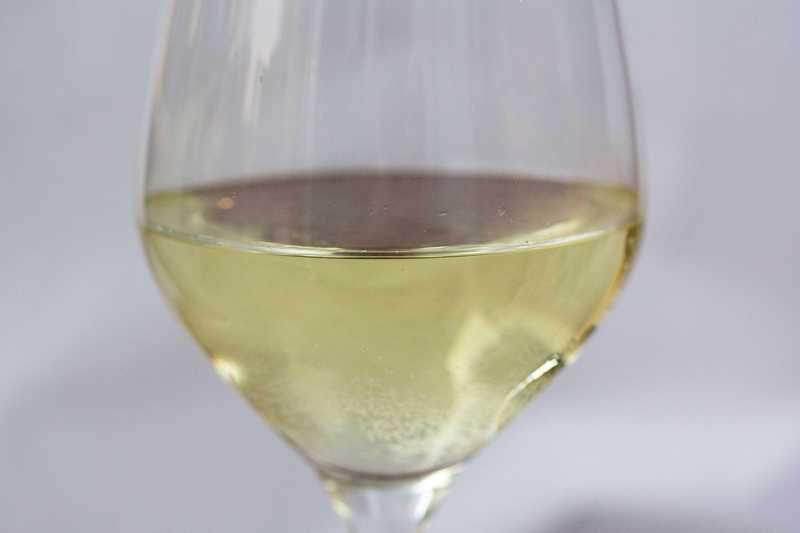 Serve the risotto with the sauce, the fish and a glass of La Rustia. Buon Appetito.